Astronomers have witnessed stellar debris being blown away after a black hole destroyed the star. Using three X-ray telescopes, scientists captured new details about these "tidal disruption" events. This event, dubbed ASASSN-14li, provides an excellent opportunity to study the extreme environment around a black hole. ASASSN-14li is located in a galaxy about 290 million light years from Earth. 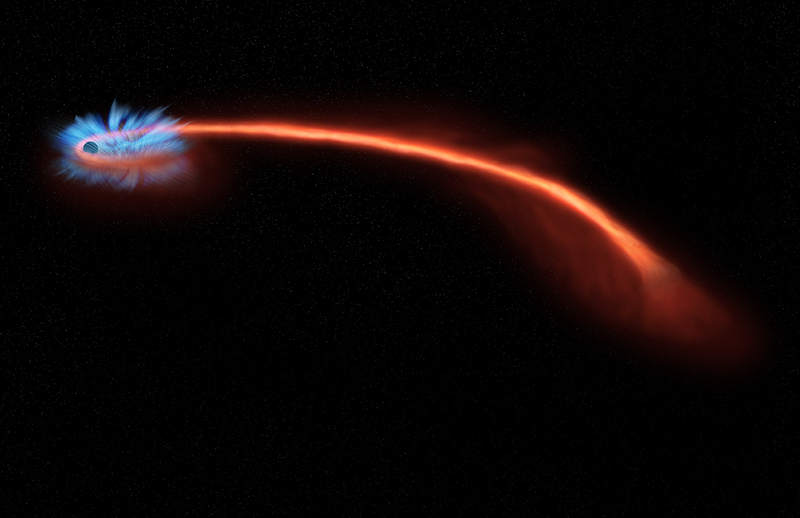 Astronomers have observed material being blown away from a black hole after it tore a star apart, as reported in our press release. This event, known as a "tidal disruption," is depicted in the artist's illustration. Astronomers used a trio of X-ray telescopes - NASA's Chandra X-ray Observatory, Swift Gamma Ray Burst Explorer, and ESA's XMM-Newton - to observe a tidal disruption located in the center of a galaxy about 290 million light years away. This makes this tidal disruption, dubbed ASASSN-14li, the closest tidal disruption discovered in ten years. The event was discovered in an optical search by the All-Sky Automated Survey for Supernovae (ASAS-SN) in November 2014. Theory predicts that early in the evolution of a tidal disruption, material from the shredded star (seen as the reddish-orange streak) should be pulled towards the black hole at a high rate, generating a huge amount of light. The amount of light should decline as the disrupted material falls onto the black hole, shown as the small black circle in the upper left of the illustration. In the case of ASASSN-14li, astronomers estimate the mass of the black hole is a few million times that of the Sun. Gas often falls toward black holes by spiraling inward in a disk. But how this process starts has remained a mystery. In ASASSN-14li, astronomers were able to witness the formation of such a disk by looking at the X-ray light at different wavelengths (known as the "X-ray spectrum") and tracking how that changed over time. The researchers determined that the observed X-rays come from material that is either very close to or is actually in the smallest possible stable orbit around the black hole. The illustration shows a disk of stellar debris around the black hole in the upper left of the illustration, and a long tail of debris that has been flung away from the black hole. The X-ray spectrum obtained with Chandra (seen in the inset box) and XMM-Newton both show clear evidence for absorption lines, i.e. dips in X-ray intensity over a narrow range of wavelengths. 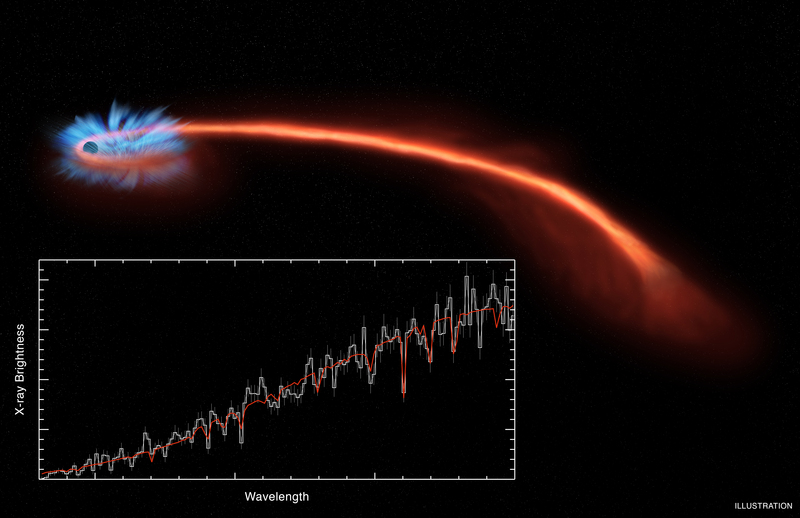 In an X-ray light version of the Doppler Shift, the absorption lines are shifted to bluer wavelengths than expected, giving evidence for a wind blowing towards us and away from the black hole. The presence of a wind moving away from the black hole is shown as the bluish white lines in the artist's illustration. The wind is not moving fast enough to escape the black hole's gravitational grasp. An alternative explanation for the relatively low speed is that gas from the disrupted star is following an elliptical orbit around the black hole and is observed at the greatest distance from the black hole where it is traveling the slowest. These results confirm recent theoretical predictions for the structure and evolution of tidal disruptions events. These results appeared in a paper in the October 22nd issue of the journal Nature. The authors of that paper are Jon M. Miller (University of Michigan), Jelle Kastra (SRON Institute for Space Research), Cole Miller (University of Maryland, College Park), Mark Reynolds (Michigan), Gregory Brown (University of Warwick), Bradley Cenko (Maryland), Jeremy Drake (Harvard-Smithsonian Center for Astrophysics), Suvi Gezari (Maryland), James Guillochon (CfA), Kayhan Gultekin (Michigan), Jimmy Irwin (University of Alabama), Andrew Levan (Warwick), Dipankar Maitra (Wheaton College), Peter Maksym (Alabama), Richard Mushotsky (Maryland), Paul O'Brien (University of Leicester), Fritz Paerels (Columbia University), Jelle de Plaa (SRON), Enrico Ramirez-Ruiz (University of California, Santa Cruz), Tod Strohmayer (Maryland), and Nial Tanvir (Leicester). NASA's Marshall Space Flight Center in Huntsville, Alabama, manages the Chandra program for NASA's Science Mission Directorate in Washington. The Smithsonian Astrophysical Observatory in Cambridge, Massachusetts, controls Chandra's science and flight operations. Swift is managed by NASA's Goddard Space Flight Center in Greenbelt, Maryland. Coordinates (J2000) RA 12h 48m 15.20s | Dec 17° 46´ 26.20"
Is this tidal disruption that Jean Pierre Luminet calls cr�pes stellaires flamb�es in french? A tidal disruption in a galaxy about 290 million light years from Earth. About 290 million light years from Earth. X-rays from Chandra and XMM-Newton.